Is your office trying to go paperless? Even if you are, you probably find plenty of times when just having a digital copy won’t work. Many clients like to have you present them with a hard copy of their audit report or proposal, while employees sometimes need to have a physical procedural manual in their hand, especially if they need to refer to it frequently. Then, of course, if a regulatory agency comes in to audit you, they want to see an actual paper trail, down to the last old, crumpled receipt. You might want to eliminate paper usage, but reducing usage is a more reasonable goal. Printing is here to stay, and savvy small business owners are finding ways to efficiently and economically bind the documents they need. When you need a document printed and bound, you want something that is both durable and professional-looking. Often this means that you will opt for spiral binding, an option that requires special equipment usually only found in print shops. When using a local print shop, you need to expend the time to drop off your job and make another trip to pick up the finished product. If you finished the document at the last minute, making a couple trips to the printer adds time you may not have planned for. Additionally, if you have drastically reduced the amount of printing and binding from what you used to do, you are probably not receiving a volume discount anymore and are paying a higher per-document cost. If your spiral bound documents have content that needs to be updated, you may have to take the books back to the print shop since disassembling the documents and putting in new pages needs to be done with the proper coil binding equipment. As an alternative to using a print shop, you may wonder about doing spiral binding in-house. After all, your company probably has a high-end color copier/printer onsite, so you already have the ability to make great-looking copies. 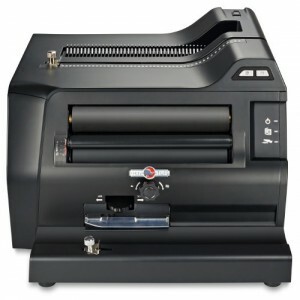 Unfortunately, until recently, most small offices were unlikely to also have spiral binding equipment on hand. In the past, coil binding equipment was large and fairly costly, which meant that unless your company needed to have a full-fledged printing department onsite, you were unlikely to invest in a spiral binding machine. As a result, your traditional in-house options for binding loose sheets of paper included three hole punching and inserting them in a binder, stapling, or using report covers. While all these methods work, they do not look as nice and the result is a document that you cannot easily open flat and turn back on itself. With the recent introduction of the Rhin-O-Tuff Coil Binding 3000, in-house coil binding has become much more feasible for smaller businesses. Rhin-O-Tuff, a well-known manufacturer of commercial binding equipment, just introduced a machine that is about the size of a desktop printer, yet has all the functions of larger equipment including drilling holes in the stack of paper, inserting the coil or spiral into the holes, and crimping the end of the coil. For a fraction of the time and money it costs to have a document printed and coil bound at a print shop, you can create your own professional looking documents on-demand. As you aim to make your office paperless, don’t forget to plan for times when you need high-quality bound paper documents on-demand. For information about the new Coil Binding 3000, contact Rhin-O-Tuff today at 800-390-5782 or 208-384-8551.